The COE Academic Foundation and Scholarship Program's mission is to grow careers in technology. COE promotes the advancement of excellence in all aspects of engineering, engineering technology and design while providing exposure for innovative student projects and professors' educational practices at COE's annual conference. Gain experience presenting their work at a professional conference through the David M. Aber Scholarship Competition. DEADLINE EXTENDED THROUGH JANUARY 11th, 2019! Network with individuals in all industries using Dassault Systèmes solutions. 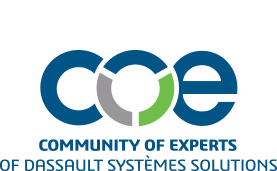 Discuss the goings on within the Dassault Academic community with other professors using their solutions. Gain new technical knowledge with over 100 hours of educational programming. The ePoster Tuition Scholarship Competition gives students the opportunity to showcase their work on projects involving the Dassault Systèmes solutions to leaders within the industry, as well as gain visibility with all attendees at the conference. The winner will receive a $2000 academic scholarship and the runner- up will receive a $1000 scholarship. Read more about the Scholarship Program from 2018 ePoster Tuition Scholarship recipient, Chelsea Sewell. Students who submit to the ePoster scholarship competition and are accepted have an opportunity to receive FREE registration, travel and housing at the conference. Students in the competition who are also eager to volunteer a few hours each day at the COE 2019 conference will be able to interact directly with COE volunteers from the industry and attend the volunteer appreciation event. Academic Professors can attend COExperience at a discounted rate of $600.00 by updating their school's membership list with 5 new students. Contact coe@coe.org for assistance.